The motor on the Beemer didn’t turn and I quickly found out why. 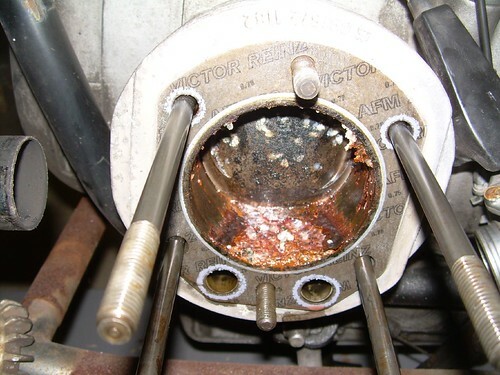 When I pulled the spark plug from the left cylinder it had mold on it. When I pulled the head I found a real nasty cylinder. It must have somehow got some water trapped in there because mold and rust were set in everywhere. The other cylinder was in perfect condtion, but both were removed. The cylinders were sent to a machinist in New Hampshire for a fresh bore. The heads were also sent to be cleaned up and have new guides, seals, and valves put in. The valve covers were sent to an anodizing shop to be bead blasted and black coated. The big change however is coming in the form of displacement! The pistons in this R80 are being replaced with R90 pistons bringing the displacement up to 900cc’s and the compression up to 10.5:1. This bike will be a screamer (relatively speaking) once it is put back together.